Home » Cool Car Stuff » Best Portable Tire Inflators of 2019 – Should You Buy One? My dad was a gadget lover (he died a couple of years ago). But most of all, he also loved cars. Back in the days before smartphones, tablets, and the Internet became popular, nifty gadgets are a dime a dozen. And they were a bit expensive, too. This includes portable tire inflators. The first time I laid my eyes and hands on a portable tire inflator was when my dad brought home a device that looked like a small compressor pump complete equipped with hoses and cables. Below is a quick overview of our top picks for portable air compressors and tire inflators. Scroll down to see more info on each one. 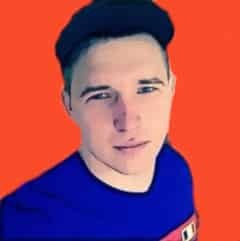 The P.I. 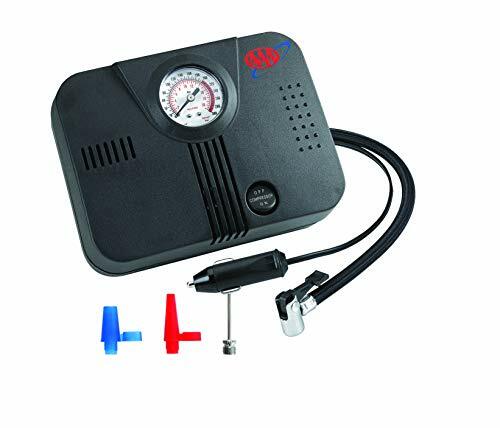 Auto Store Digital Tire Inflator has a glass-filled nylon housing that is both abrasion and impact resistant. It has a maximum pressure of 150 psi and it can inflate a standard tire from 0 to 30 psi in 4 minutes or less. This product claims to inflate the tires on passenger cars, motorcycles, SUVs, and even light-duty trucks. This portable tire inflator weighs in at around 2 pounds. It is relatively small and compact so you can store it neatly in the trunk or glove compartment. What I like best about this device are the long braided air hose and extra-long 13-feet power cord. This allows you to easily inflate the tires from all four corners of your vehicle. The P.I. 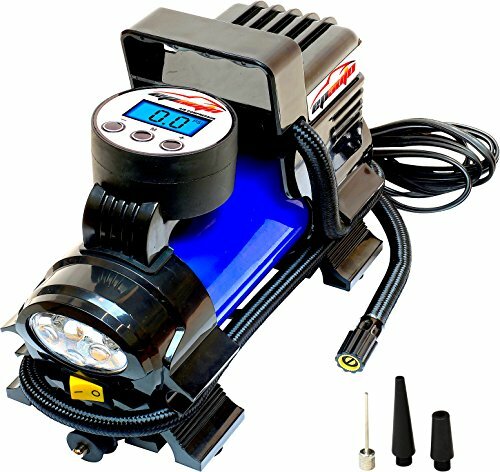 Store Digital Tire Inflator is also equipped with a flashlight with 8 super bright LED bulbs. You can configure the flashlight as a standard beam, flashing red, or SOS indicator. It even comes with an auto-shut off function and a digital pressure gauge. Compact: The 10 ft DC power cable and 1.5 ft quick connect air hose are easily stored inside of the compressor. The compressor's measurements are 8" x 6" x 4". This Lifeline Air Compressor has the distinction of being recommended by the American Automobile Association or AAA. It is small and compact and it only weighs around 2 pounds. It is equipped with a quick connect air hose with 3 nozzle adaptors and a 10-foot power cord. It also has a built-in analog air pressure gauge. This device is powerful enough to inflate up to 300 psi, though I didn’t get the chance to find out if this is true. The Lifeline AAA 12V Air Compressor can inflate a standard tire (195/65/R15) from 0 to 35 psi in about 8 minutes. This is not exactly quick by any standards, but it sure beats the hell out of getting stranded with a flat tire. My only complaint is the noise. This is one of the most compact tire inflators in this test, but it sure makes a lot of noise for such a small size. It also vibrates like it needs Diazepam. The ENGREPO Portable Air Compressor is unique because it comes with a built-in rechargeable lithium-ion battery. You know what this means, right? Yes, this portable tire inflator is cordless, although you can also plug it into the cigarette lighter socket when you run out of juice. This cordless tire inflator is equipped with a backlit LCD digital display. This makes it easy to use even in the dark. It is also equipped with an auto-off system that shuts down automatically when the desired tire pressure is achieved. The fast charging capabilities of this cordless tire inflator are impressive. It only takes 1.5 hours to fully charge the battery. I also like the fact that it has a maximum pressure of 150 psi for such a small and compact device. The maximum power output is 60 watts. This makes it perfect for passenger cars and small SUVs (trucks not included), and motorcycles. The EPAuto DC Portable Tire Inflator can inflate tires on cars, bikes, motorcycles, and SUVs. However, this product is not designed for LT, HT, and truck tires. 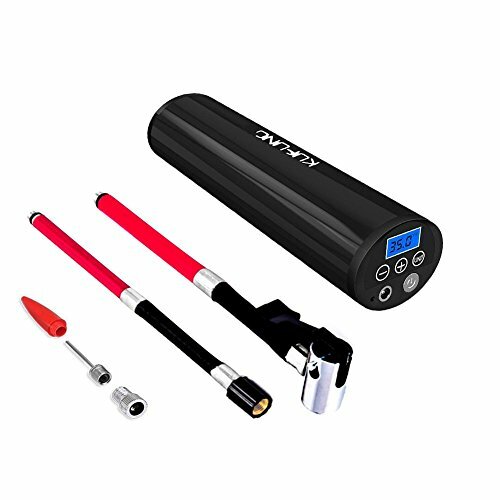 This tire inflator is equipped with an easy to read digital tire gauge that displays the tire pressure in PSI, KPA, BAR, and KG/CM. With that being said, this tire inflator is designed to inflate up to 100 psi. What I admire about this nifty device is the auto shut off function that automatically turns off when the desired tire pressure is reached. It also features an overheating protection circuit that shuts the tire pump automatically when the circuit reaches 167 degrees Fahrenheit. The EPAuto DC Portable Digital Tire Inflator has a rated power output of 120 to 180 watts. It plugs directly into the cigarette lighter socket and has a working voltage of 12 volts DC. This unit is also equipped with a LED flashlight so you can use this in the dark. 12 VOLT - 120PSI Max Working Pressure, engine must be running during use. Portable air compressor powered via alligator clamps direct to battery. Let me start with the bad. The Viair Portable Air Compressor is a bit heavy at 4.5 pounds. It is the heaviest tire inflator in this test. It also works via alligator clamps that connect directly to the car battery. This is not exactly a big issue if you’ll ask me, but nothing beats the convenience of simply plugging in the power to the cigarette lighter socket. 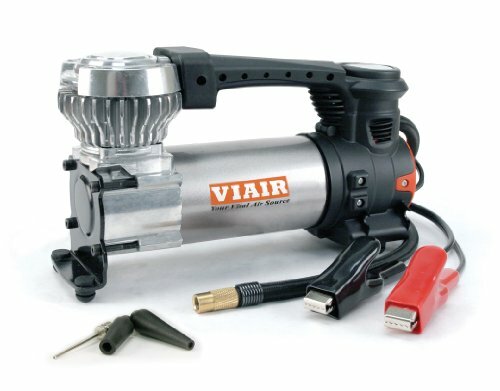 The Viair Portable Compressor is powerful enough to inflate the tires of passenger cars, trucks, and SUVs. In fact, this portable tire pump can inflate tires up to 33-inch in size, which makes it ideal for off-road use. This tire inflator is also equipped with 10-foot power cord and 16-foot air hose. It even comes with a 3-piece inflation tip kit. It has a maximum pressure of 120 psi and it is also equipped with an analog tire pressure gauge. I fondly remember him being so excited about his purchase. He beamed proudly as he showed me his new portable tire inflator. It draws power from the cigarette lighter and it was easy to use. Sure, the thing was a bit heavy and it created a hell of a noise when you turn on the power, but it sure beats rushing to a nearby petrol station just to get the tires inflated to the right pressure. It sounded like a small vacuum cleaner in distress, but it seemed it can get the job done. We first tested it on my bike. I intentionally allowed a bit of air to escape from the tire so we could test my dad’s new portable tire pump. After about 30 seconds, the tire was pumped up. This thing had a small but archaic pressure gauge so you can monitor the tire pressure. It works. I gave my dad a high five! Next, we tested it on my scooter. It was a relatively small Suzuki motorcycle with a 100cc motor. The rear tire needed some air anyway, so we gave it a go. The tire was pumped up in under a minute. Pretty impressive stuff. Take note that we had the portable tire compressor plugged into the cigarette lighter of his Nissan Maxima while we were performing the tests. But I told my dad that we should try it on his car. I was a sprightly teenager during this time, and I was only too excited to release some air from the front tire for the test. Unfortunately, I took things a bit too far. I allowed too much air to escape, so now we have a flat tire. My father, ever the optimist, simply shrugged it off and proceeded to connect the air hose to the tire plug. He turned on the power. We kept our fingers crossed. After about 2 minutes of intense noise, the tire was slowly raising itself from the ground. Hey, it works! The sad part was that the tire compressor died in about a week. My dad bought another one, and it had the same fate as the first one. It died in about a month. This is the reason why I had my apprehensions when creating this list of the 2018 best tire inflators. Yes, they work. But most of them had issues with longevity and quality. But we are now living in the age of electric cars and reusable space rockets, so I assumed that the quality issues would have been sorted out. Nitpicking aside, it helps to always have a portable or cordless tire inflator in the trunk at all times. This especially holds true if your vehicle is equipped with RFT or run flat tires since you won’t have a spare tire in the trunk. Perhaps the most compelling reason to check out this list of the best portable tire inflators is proper tire maintenance. Tires don’t need a lot of TLC, but they do need to be properly inflated all the time. When was the last time you checked the tire pressure in your car? Last week? 2 weeks or a month ago? Like I previously mentioned above, your tires don’t need a lot of tender loving care. I can go on and preach about your tires being the only parts of the car that connects to the road, but it all boils down to one simple thing. A flat tire will get you nowhere, and it will leave you stranded on a deserted road or parking lot. Personally, this is the reason why I always check the tire pressure every time I fill up my car with petrol. I also make it habit to visually inspect the tires before each and every trip. According to the Department of Energy, properly inflated tires will improve fuel economy by 3.3%. That doesn’t sound like much, but it adds up in the long run. If you have a portable tire inflator, you can always top up the tire pressure wherever you may be. If you happen to have a flat tire, a portable tire inflator will definitely come in very handy (unless you have a blown tire). Here are some more reasons why proper tire care is a crucial part of car maintenance. Handling and braking performance will depend on the integrity of your tires. Keeping them properly inflated will allow you to execute emergency maneuvers more easily. Maintaining the correct tire pressure will prevent excessive tread wear and prolong the life of your tires. Tires are expensive and they are a grudge purchase second only to gasoline. Incorrect tire pressure will increase the rolling resistance of your vehicle. Too much air pressure will reduce handling performance, and too little of it will cause the tires to overheat while driving. This could result in a tire blowout at speed, which can lead to a catastrophic accident. Purchasing a portable or cordless tire inflator is cheap insurance against flat tires or tire failure. If you do a lot of driving, then you should definitely consider the best tire inflators as part of your emergency kit. Make no mistake about it. The reason these products are included in my list of the 2018 best portable tire inflators is that they all perform admirably despite the minor complaints about noise, weight, and inaccurate pressure readings. If I were to really choose, my money goes to the P.I. 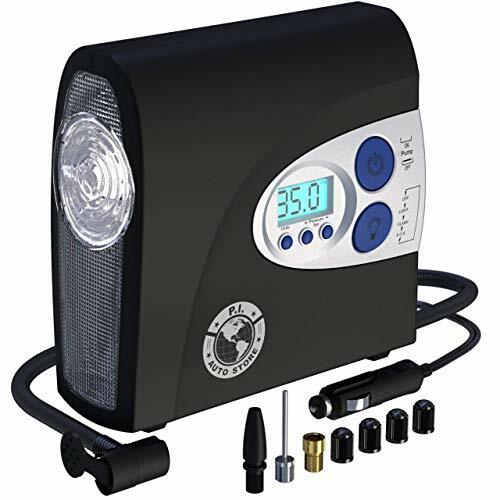 Auto Store Premium Digital Tire Inflator. I would have chosen the wireless convenience of the ENGREPO Portable Air Compressor, but it is only good for occasional use on small passenger tires. My dad would have been proud of these portable tire inflators. If you enjoyed this article, check out our guides to choosing a new car battery, finding the best windshield wipers, or improving fuel economy with new spark plugs.